We can all indisputably agree on that the three best things on 🌎 are warm blankets, emojis, and Slack. And when I discovered that I could add my own custom emojis into Slack, it was arguably one of the 🎉 😍 moments of my short-lived life (barely exceeding a close number two, when I discovered this warm blanket). 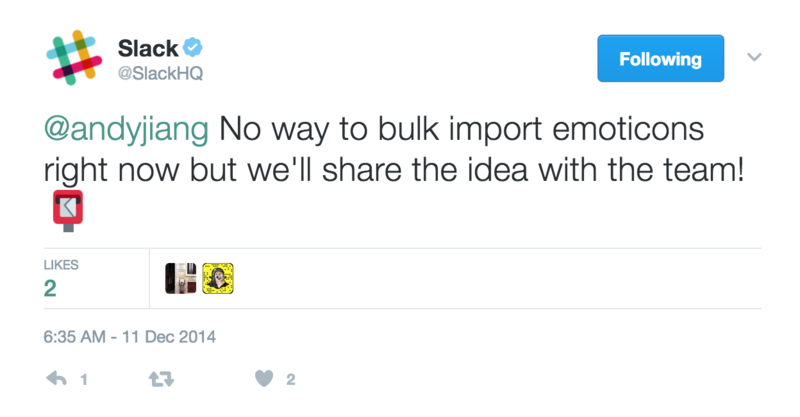 So I built emojipacks, a command line interface, to bulk upload emojis into Slack. Let's take a 👀 at the code that accomplishes this ✨🌟✨🌟 feat. Shortly after I discovered the ability to add custom emojis in Slack, I was hooked like a 🐟 . I 🍩 even remember taking a break until the first 💯 emojis were added. But 🚢 emoji after emoji inevitably ate away at my entire day at work. Though I managed to enter a rhythm of 🔦 for emojis and then uploading them all at once, it still took a long ⌚️. I had to 🚧 off ⌛ ️on my 📅 just so I was able to have uninterrupted time dedicated to uploading emojis. Not the most glamorous of jobs, but somebody had to do it 🙌 💪 . So they have a 👔💼 to 🏃 and maybe there are way more important things on their product road map 🙊. Maybe. Fortunately for me, the Internet is made of a series of tubes, so there is definitely a way to hack together a solution to accomplish this. A few, long 🌑 🌓 🌕 🌗 🌚 of ✋ uploading one-off emojis pass. Until one 🌞, I came across this awesome project on Hacker News and was reinspired to 🔨🔧 something to bulk upload emojis. 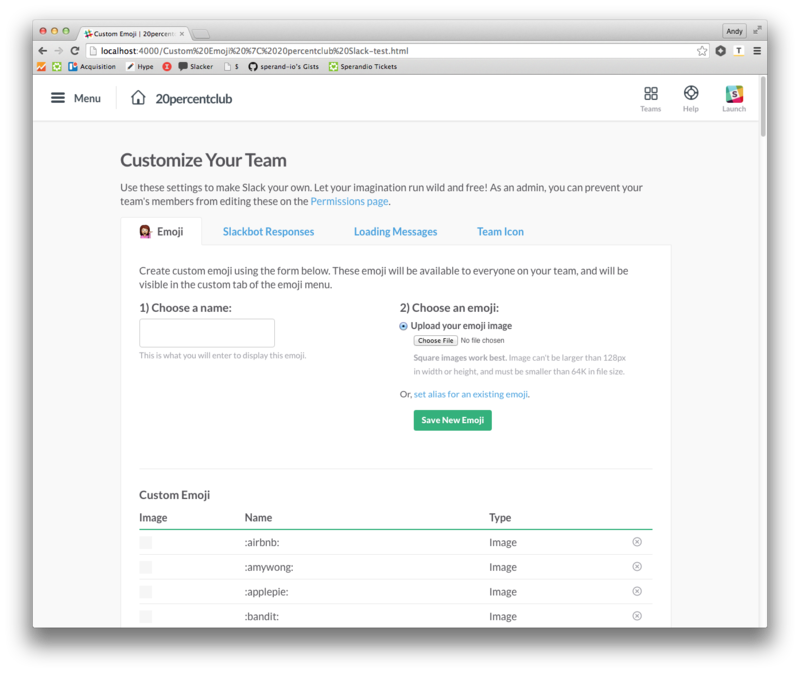 Slackporter allows you to transfer emojis from one Slack account to another. Super neat. 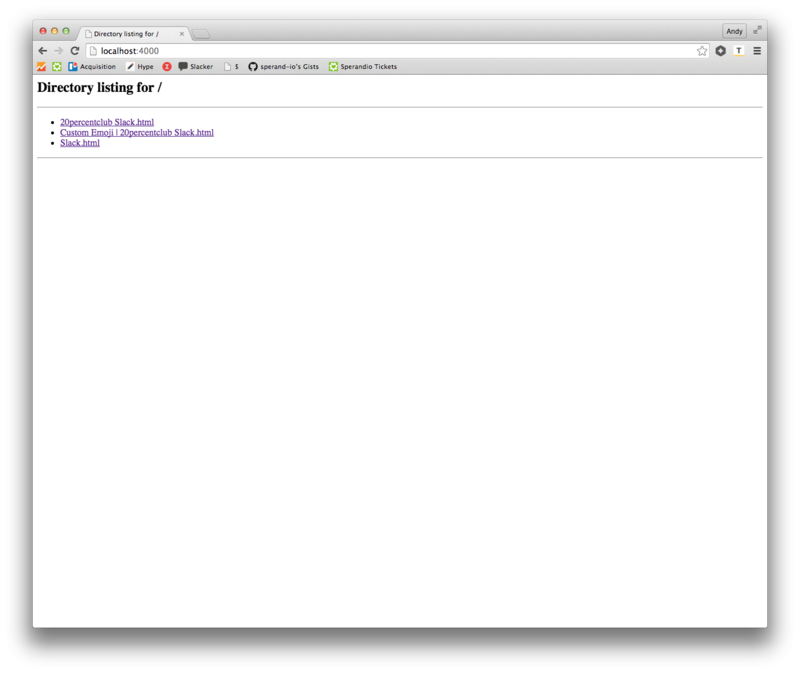 Plus the developer is responsive on Twitter (super nice guy, too)! I decided to re-use these 🔑 pieces: ✊ the user login information, logging in, and submitting the emoji form. I also re-wrote it with Koa and generators. The result is emojipacks! The script uses Cheerio for server-side HTML parsing and manipulation and Request to submit form requests. Then, the script grabs some 👻 form data, such as the sign in value, redirect path, and a unique session crumb. 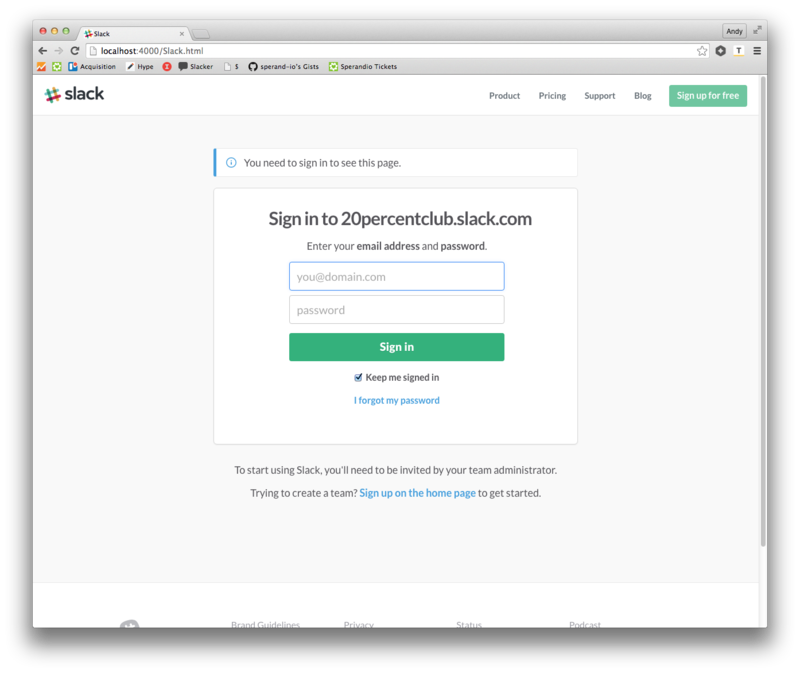 This 🔮 is used later to log into Slack. 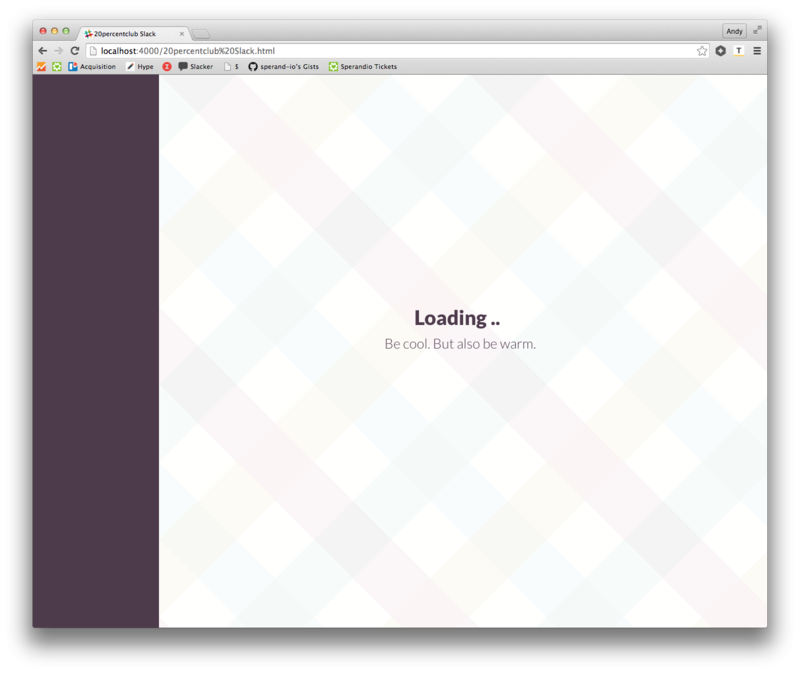 Note that this won't ever load, since it is a static HTML file. Here, we grab an upload crumb from an input field. We'll use this crumb when programmatically submitting the form submit request. To help me understand which HTML page the script was on, I 📝 the Cheerio-generated HTML to `'./test/<title>.html'` files. Then I could open it up and see where I ended up in the upload emoji flow. After 🏃 the script, I can go into the `./test` directory, use this nifty dotfile command `server`* to spin up a local server in that directory, and check it out with my browser. Then you can browse to see where the script was able to navigate. *The super convenient `server` command is taken from my mate Anthony's dotfiles. So there you have it. The only thing next is to make more emoji 📦🎁 and try to find the upper limit in the number of custom emojis you can have in Slack. 🌊 you doing today? If you would like to contribute, please suggest an emoji pack!